Mr. bull the _________ is collecting the _________. but Mr Bull is not very good at being quiet. Peppa and George are finishing their breakfast. - It's Mr Bull, the bin man. - Hello, everyone! I must be off, lots of rubbish to collect!. - Mr. Bull has emptied the _____________ for us. - Can we help, mummy? - Let's _____ this empty ______ in the ___. - We don't put bottles in the rubbish bin. They can be recycled. - All the things we can't use again we put in the rubbish bin for Mr Bull. - But all the things that can be used again are put in these ________ ________. - The red one is for __________, the blue one is for ___ ____ and the green one is for bottles. - Peppa, you have a bottle, so which box does it go in? - Errmm, the green one. - Now, it's George's turn. - Oh! Can you find a newspaper for the red box? George wants to recycle Daddy Pig's newspaper. - Oh, I haven't finished with my newspaper just yet, George. You can have it in a minute. - Newspapers go in the red box George. - Now that we have collected enough things, we can go to the _______ ______. - Mummy Pig has the bottles, Peppa has the tin cans and George has the newspapers. - Tin cans! Bottles! Newspapers! - Have you come to do some recycling? - Jolly good! Carry on! - What's Miss Rabbit doing? - She's recycling all the _____ old cars. - Who can tell me which bin the bottles go in? - And the cans go in the blue one. George wants to recycle the newspapers. - Ok, George, you can do the newspapers. - There! That's enough recycling for one day. - Yes, let's go home. - Oh! where's our car gone? - Peppa's car has disappeared. Miss rabbit is recycling Peppa's car! - Stop! That´s our car! - What? Is it really? - Yes! Our car isn't old and rusty! - Silly me! I just love recycling. - Yes, so do we! But we also love our little car! - Yes, and our little car loves us too. Don't you? Activity 2: Game "Roll the dice"
We are going to divide the class into two teams. There are six picture cards (only pictures, no words) about the vocabulary of previous activity on the whiteboard. Each card has a number from 1 to 6. One student will have a big dice to roll. The whole class will watch what number comes up. The first student to say the word of the vocabulary card with the same number of the dice will win one point for his team. The first team that reaches 15 points will be the winner and then we will replace the cards on the board with the last 6 new cards. What is doing Mr.Bull, the bin man? At first, where was Peppa going to throw a bottle? What did her mother say? -Can bottles be recycled? 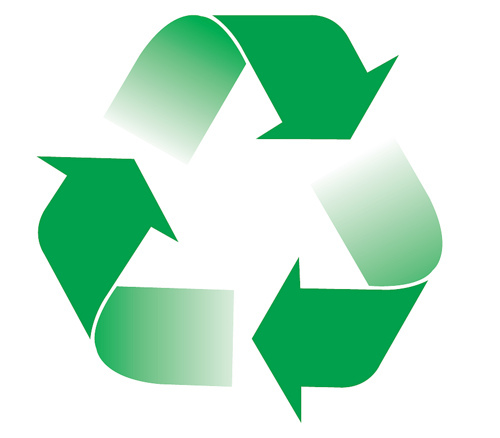 Do you know the meaning of the term "recycle"? -What does that mean? Do you think you should recycle? -What do you think might happen without recycling? Which box did Peppa put the bottle in? - Where do you recycle? - How do you recycle? What else did George throw at the recycle box? - What materials do you recycle? Do you think you could recycle more? Where did Peppa´s family go by car? - Why? – Do you usually go to a recycle centre to carry the recycle boxes/bags? - Where do you throw the recycle boxes/bags? - - Who does usually carry the recycle bins? 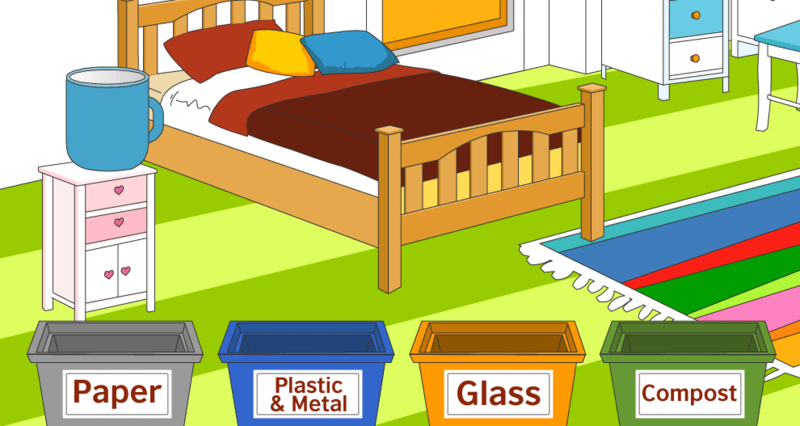 Have the recycle bins of Peppa´s city got the same or different colour than the recycle bins of your city? Now click the button Activity 3 to know why we should recycle. 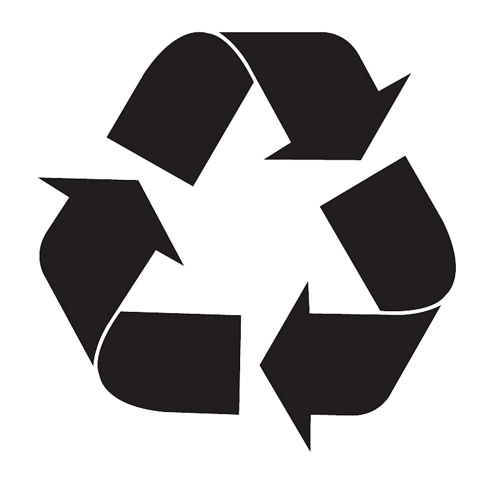 After that, click bellow to know the recycling cycle and the recycle symbol. Game 1: "Clean and green"
You have to put different things into the right recycling bin. The bin named "Compost" is for organic waste, that is food waste. Sort the waste into the right bin and try to earn as many points as you can. Watch out! : you must fill the indicated bin.